Someone, somewhere, thinks it is a good idea to keep turning the board game Space Hulk into a video game. It’s tempting to file each Gameplanet review in this long line of titles (Space Hulk: Tactics being the latest) as just one sentence linking you to our previous review. 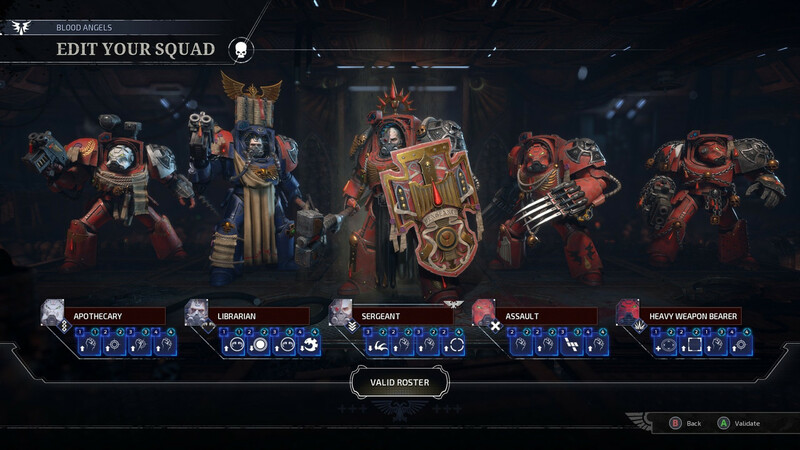 But that’s not quite fair, as Space Hulk: Tactics is probably the best conversion yet, with a number of improvements that bring the now 28-year-old game into the modern era. It’s just...it’s still Space Hulk. Decent graphical presentation includes the ability to go down to grunt level with a first-person view and get a close look at the action in the gloom. For anyone that’s somehow missed all of the approximately 612 Space Hulks to date, the game is a tactical simulation of a specific asymmetric combat scenario in Game’s Workshop’s grimdark-pioneer setting, the Warhammer 40K universe. There, heavily-armed religious fanatics and fascists known as Space Marines are actually the good guys. They’ve got their issues for sure, but they’re at least slightly better than the Genestealers. These are a bunch of swarming, bio-horror tooth-and-claw jobbies who are out to destroy all other life in the universe. They've set up their nest in the titular space hulk, a massive conglomeration of wrecked starships that drifts around the universe for millennia, wrecking the day for anything it smacks into. 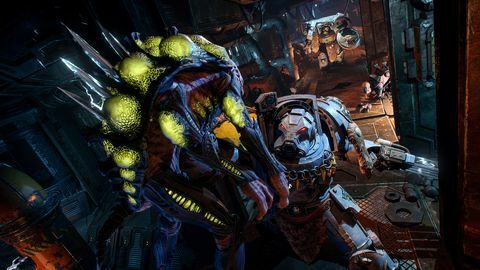 With the Imperium of Man’s starship weaponry as usual somehow not up to just blowing this giant piece of bug-infested flotsam out of the sky, it’s once again up to the Space Marines to board the thing and navigate its claustrophobic corridors, seeking to destroy it from within. In Space Hulk: Tactics this job falls to the Space Marines’ Blood Angels chapter, as the titular hulk bears down on an important Imperium forge world populated by billions. Players take control of a squad of 5 marines, each a lumbering human tank that turns like a battleship, and sets off into each map with a simple objective - pick this thing up and take it over here, plant a bomb here and escape, defend this point, and so on. Maps are a series of small rooms, interlocked by boxes of corridors. Each marine starts with a basic 4 action points per turn that they can use to move, shoot, and interact with objects like doors and consoles. Specialist marines, unlocked as the campaign goes on, offer bigger guns or some handy psychic abilities. 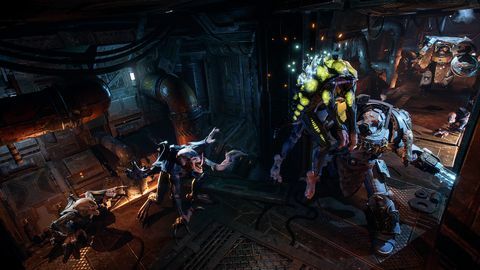 The Genestealers, on the other hand, are faster and move around the map as ‘blips’ of unknown quantities of 1-3 units before revealing themselves when in sight. The Space Marines maintain total ranged superiority; the Genestealers are better in melee combat. Shooting success and melee results come down to the rolls of six-sided dice. Perhaps it’s a bit tough to pick on a lower-budget game for being lower-budget, but it’s just that you can really feel that here. 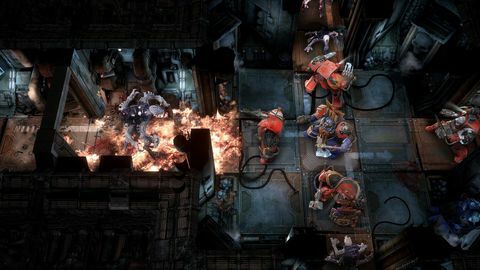 To its credit, Space Hulk: Tactics offers some new wrinkles to this basic setup, which has powered not only the board game but all of its videogame adaptations as well. A very welcome addition is tactical cards, which can be played for gameplay advantages (melee wins, dice boosts, extra actions) or converted to extra squad action points that allow marines to take those extra crucial actions on a turn (this can sometimes just be a matter of someone needing to rotate 90 degrees). Decent graphical presentation includes the ability to go down to grunt level with a first-person view and get a close look at the action in the gloom, which adds to that 40K atmosphere, even if it is 100% tactically useless. And in-between missions the story plays out with a sort of route-selecting mini game through the hulk which incorporates a very rudimentary character progression system. There’s quite a lot to like here. Forming your squad methodically into sort of a bristling hedgehog of death and plodding it through the hulk leaving genestealer corpses in your wake can be job-well-done satisfying, much in the way looking at the big pile of firewood you spent all afternoon stacking is. The game also avoids the trap of totally uniform environments, with different flavours of ship in the Hulk (like Ork and Eldar). There’s also some decent writing which I imagine fans of the setting will especially appreciate, as the various factions of the Imperium come into play and the Blood Angels get distracted in their mission by a quest for glory. But as a tactical videogame experience, Space Hulk: Tactics is let down by both budget constraints and its faithful approach to adaptation. Perhaps it’s a bit tough to pick on a lower-budget game for being lower-budget, but it’s just that you can really feel that here. It means things like the story playing out mostly as radio-style talking heads, in-engine cutscenes and a lower investment in the hulk map and RPG-style progression parts of the game. Upgrading seems like an attempt to introduce an XCom-style individuality to the marines, allowing you to unlock new cards, weapons and dice buffs for them, but there’s none of XCom’s permanent death - lose Sergeant Tahariel in a mission and he’s back fighting fit again in the next map, so there’s not a lot of getting invested. As well, many of the weapon “upgrades” are to options that seem less effective than what you start with - improving ability in melee for example, which you generally try to avoid, or emphasising area control, which you generally don’t need. So it all seems a bit inessential unless you’re trying to change things up for the sake of it. it’s hard to feel like much of a strategic genius when the key to success is hoping that 1 or 2 doesn’t come up on a die three times in a row. Inessential could describe the campaign map, too. Your squad moves around nodes on a branching track around the hulk, with each node travelled to raising a genestealer threat level. When this hits a certain threshold, a random encounter is triggered. These are small maps with basic goals, but they can be skipped by deploying a marine from your roster, who is then unavailable for the next mission. It is easy to see most players deploying this option frequently, as the random maps are small, dull, and actually repeat themselves, and the consequences of success or failure only mean a few more or less upgrade points to spend on your squad. But it’s the limitations of the actual board game system that might hurt the Space Hulk: Tactics most. There just isn’t a lot of tactical variety. Most missions boil down to methodically getting your squad to the right corridor junctions and activating the marine’s all powerful overwatch ability, which means they shoot at any genestealer that moves into their (12-squares-long) field of fire. As the genestealers the AI is reluctant to take overwatch (which is not a guaranteed kill) on with its units, which means the overall gameplay feel is not one of cunning strategy or daring gambles, but of just not cocking up. The Space Marines carry all sorts of death-dealing equipment into battle with them, but the one thing they don’t have that could have saved them from every single military disaster I experienced during their campaign is a confirmation prompt for ending their turn (several times I ended a turn without issuing any orders with a foolish button press). Switches which open a number of doors simultaneously, portals across the map and the librarian units extra psychic abilities offer a little bit of a variety, but taken together with the lumbering feel of the Marines, it’s all a bit of an almost preordained plod. If you like tactical games that force you to scramble and improvise, you won’t find one here. This is only emphasised in the genestealer campaign. 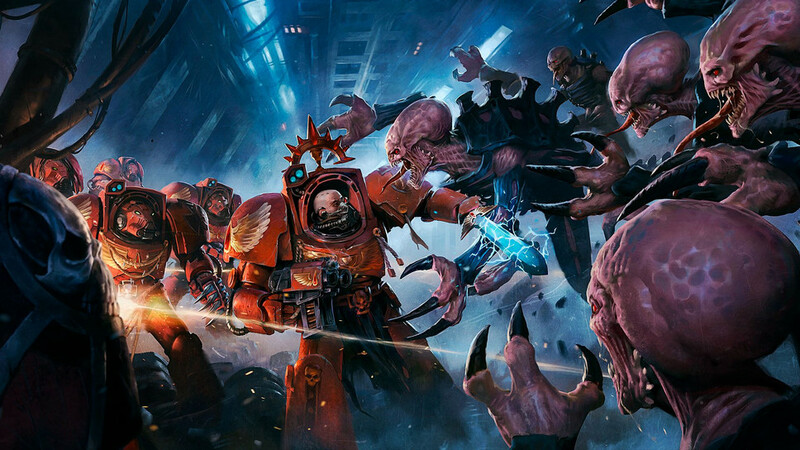 This is rather niftily set on the same space hulk thousands of years earlier, as the genestealers react to an invasion of Ultramarines that the Blood Angels keep finding the bodies of in the marine campaign. If the Space Marine campaign is all about just being careful, the genestealers are all about waiting for a mistake. Their gameplay is slightly different, with cards being traded not for more action points, but to spawn more of their number. But a successful mission still most often comes down to waiting for the AI to do something dumb, or running through some overwatched squares and getting lucky. At least humans will be more prepared to try that gamble than the genestealer AI in the marine campaign, but it’s hard to feel like much of a strategic genius when the key to success is hoping that 1 or 2 doesn’t come up on a die three times in a row. The game also offers the option to jump into multiplayer skirmish matches - although it seems tough to find a game, at least on New Zealand hours. This is a shame, as human vs human battle seems like it would be the best way to experience the game's systems. You can also create your own maps from the game’s set of corridor and room tiles and take those to the web, and no doubt genestealer players are already putting maps with as few long corridors as possible together. Space Hulk: Tactics good use of the 40K setting, solid technical conversion of the board game and little additions make it enough of a decent game to qualify as a diversion for strategy fans or fans of the setting. But it’s a little let down by its lower-budget status and limited scope of its source material. We’re still really waiting for a 40K tactical game that casts off the simplified Space Hulk completely and embraces all the complexity of the tabletop wargame. One day, maybe. In the meantime I’ll be in this darkened corridor, painfully rotating a guy a quarter of a turn at a time. Ups Good technical conversion of the board game with decent presentation. Cards add some much needed gameplay variety. Some decent writing and voice acting in the campaigns makes good use of setting. Downs Space Hulk is ultimately a pretty simple game with limited tactical options. Upgrades and campaign map feel a bit inessential.